The Gay Gamer: Review copy of Cladun X2 incoming! I don't want to jinx it by saying so, but it appears I'll be receiving a third free game sometime this week. Which one? Cladun X2. 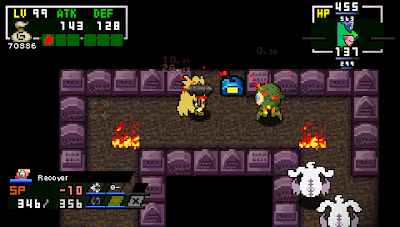 Yep, that looks like Cladun! How fantastic! That sounds like the perfect setup. You get to do what you love--play video games--for free so you can do what you love--write about them! NIS America has pretty nice reps, so I expect they should get back to you. :) If not, don't worry, as there will be more opportunities! Oh, Bryan, I just sent you a message on Twitter and I hadn't seen this post! Now I feel silly. Anyways you probably saw my message... It's awesome that you might be getting a review copy! You totally should, I know your coverage of it would be great. NIS America kindly offered the staff at VGW a download code and apparently I'm the only one who's good for these kinds of games, so my editor passed it right on to me :) It'd be great to compare notes as we play! Don't feel silly. I *just* saw the message. In regards to that, BTW, yes, I definitely can give you some pointers, if you think that would help. Let me stew on it tonight and get back to you tomorrow, OK? Anyway, it's great that you got or are getting a download code, too. Are you looking forward to playing it? If you like roguelikes and RPGs, you'll love it (I think). Yayyyy I got my code too! We can all review the game and compare notes when we're done :P.
Hey, that's great, Marcus! Did you play the first Cladun, BTW? If so, what did you think of it? I have the first Clandun, but have yet to bring myself around to playing it! I picked it up initially due to you sharing your thoughts about it on here :). Haha, now you know! Yup, I've had a PSP since near launch and probably will get a Vita around the same time frame (despite my wallet objecting). So, now that the sequel is out (or will be shortly) and you have access to it, will you ever play the original? As for Vita, although I like the looks of it, I'm definitely going to hold off on it for quite a while. I'll more than likely get a 3DS first (next year?) and then wait a year or even two before pulling the trigger on the Vita. Yeah, I'm probably going to give it a shot since there's all this time before we gain access to the 2nd game. Yes, I'd definitely recommend at least giving it a shot before you start the sequel. It can only make the sequel easier to get into, right? Are you planning to wait until the Vita is released here before buying it, or are you going to import a Japanese one? I'm probably going to buy a US Vita. There's not *that* much of a hurry for me to get my paws on one :P.
The Vita's coming to NA in spring 2012, right? In a way, I'm surprised they aren't releasing it this fall in Europe and NA and in 2012 in Japan, considering how the PSP is doing in each of those regions. I agree, it's a very odd choice to release the Vita at the times they've chosen. Spring 2012 isn't that far off, but they're going to miss the holiday season in America! It just seems strange that would be the most appealing business decision. Yeah, and on the flip side, the Vita probably doesn't *need( to be released before the holidays in Japan, as the PSP continues to hold its own against the DS and 3DS.